Imagine this scenario. You have a WooCommerce store with over 5000 products, of which some 2000 are variable products. Now, you want to make some changes to the prices across the store. Say, for example, you want to increase the price of all your products by 5%. If the store had only simple products, you could have easily managed it with the built-in bulk edit option of WooCommerce. But unfortunately you have a lot of variable products and how will you edit them in bulk. In this article, we will demonstrate how you can bulk edit price for multiple variable products using ELEX Bulk Edit Products, Prices & Attributes for WooCommerce plugin. When you have a large number of products on your WooCommerce store, this plugin can be particularly useful to edit different aspects of your products. Let’s quickly see how it will make your life easier. Great filtering options – You will find very convenient options to filter the products which you want to edit. To filter products, you can use different aspects such as product title, type, categories, attributes, price, etc. In addition, you can use options like Regex pattern matching while filter products using product title. This gives you the control to selectively edit products, or at times, you can simply leave all the filters blank and edit the entire product catalog. Edit multiple aspects of your products – The plugin helps you edit diverse aspects of your products. You will be able to edit Price, Stock, Weight and Dimensions, Categories and Attribute values of your products, along with some general aspects like SKU, product visibility, etc. 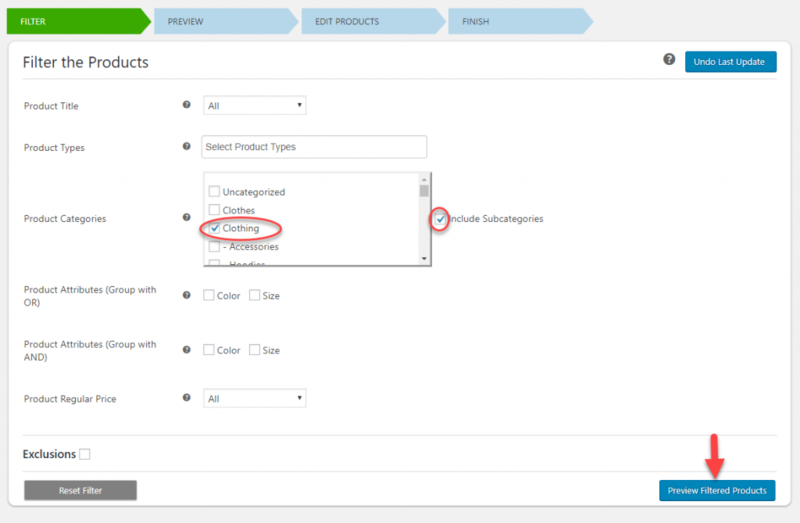 Options to exclude products from editing – Sometimes, you might want to exclude certain products from the bulk edit operation. The plugin offers you an option for this. 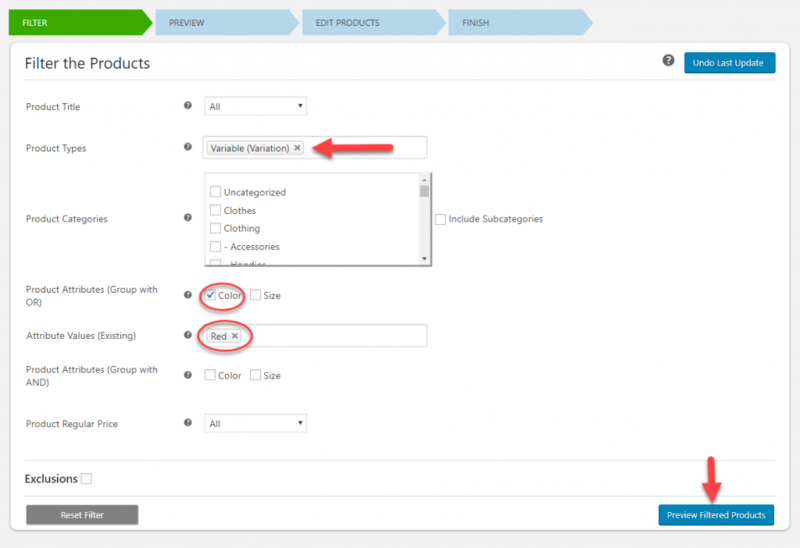 You can specify product IDs or categories, which you want to exclude from editing. Undo last operation – The plugin also helps you undo the last operation, in case you have any confusion about the edits that you just made. Also, at each point of operation, you can click the back button to go to the previous screen. Fast and accurate – Once you filter the product according to your requirement, you can trust the plugin to make the edits accurately and quickly. You will be able to edit more than 10000 products at a time. So, this plugin would be really an asset for WooCommerce stores with a large number of products. How to bulk edit edit price for multiple variable products? Now let’s look at how to use the plugin to edit price for variable products. Watch the below video tutorial to understand the step-by-step process. If you prefer to read the process in detail, go ahead. Basically, the operation of the plugin is similar to what you have seen in other tutorials. The plugin works in three steps. You will see the screen to filter the products. Leave all the fields as it is and click ‘Preview Filtered Products button’. Now you will be in the preview screen where all your products are selected. If you want to make any changes to the applied filters, you can click the Back button, or else click the Continue button. There will be a pop-up asking you to confirm the action. Click ‘Yes, proceed’ and you will be on the edit screen. Here you can scroll down to the price section. From the drop-down, choose Increase by Percentage. Now you will see another field next to the drop-down. Enter 5 here. If you want, you can roundup the price to the nearest value instead of showing the decimal places. Click the Update Products button. Again, the plugin will ask for confirmation. Click Yes, Proceed. And you are done. 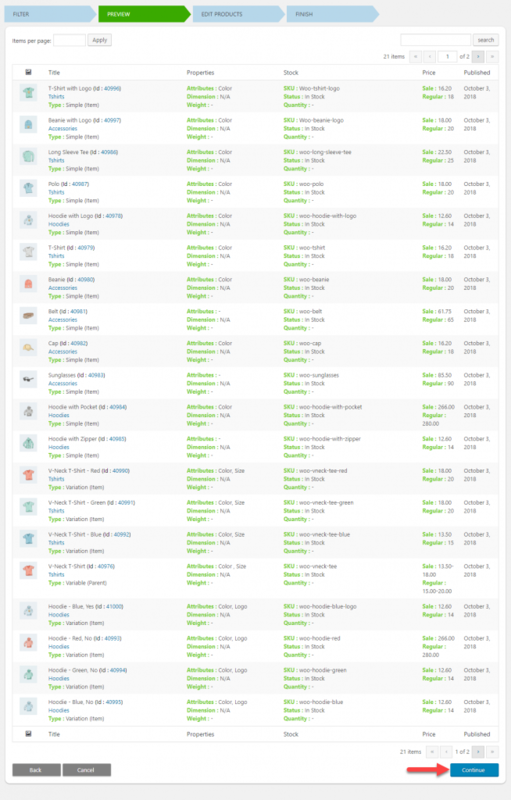 The plugin will update the products in batches of 100. And within no time all your products will be updated. You can check a few to see if the price has been increased by 5%. Here the process is more or less similar, but you need to apply filters to select only products with the attribute value ‘Red’. Let’s see how to go about this. 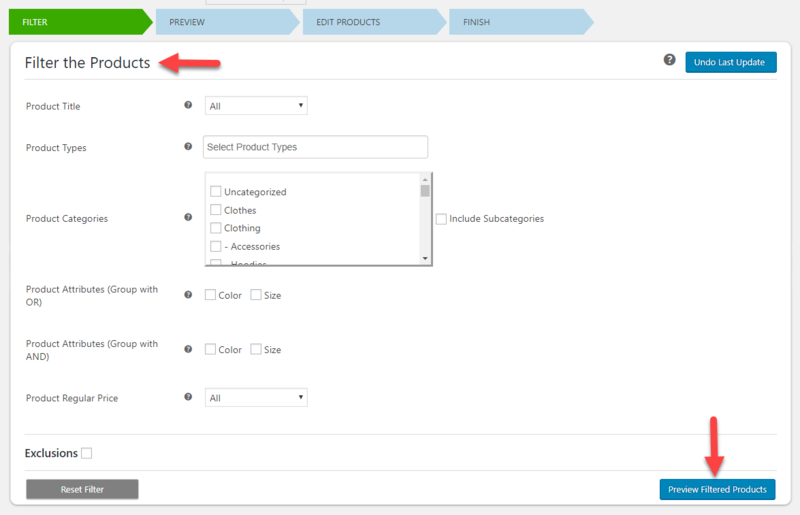 On the first screen (Filter the products), select Color on the Product Attributes section. Now a select field will be displayed to pick the attribute values. Here select ‘Red’. Click the Preview Filtered Products button. Now you will see only the variations with color ‘Red’ are filtered. Click the Continue button. On the Update screen, select ‘Increase by Percentage’ option and enter 10. Click the Update Products button, and you are done! In this case, we will filter only the products under category ‘clothing’. On the Filter products screen, select category ‘Clothing’. Check the ‘Include subcategories’ option, if you want to include all the sub categories under Clothing as well. if you leave this unchecked, only the products specifically marked under ‘Clothing’ category will be filtered. Now, you can see the preview of all the products under category ‘Clothing’. Click the Continue button. On the Update screen, select ‘Decrease by Percentage’ and enter 15. Click the Update button, and you are done! Now you have understood how to bulk edit price for multiple variable products in one go. Checkout the documentation page for more similar articles.